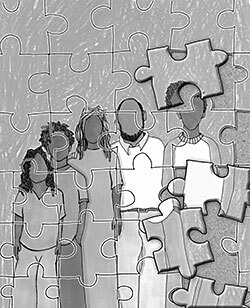 Do No Harm – Trauma-focused courts address the roots of foster care placement. Q: How did you decide to focus on trauma in your court? Neri: We know that families who come to family court have had significant trauma in their pasts. Claire: We see parents who grew up in foster care coming back into the system as parents all the time. We decided that if we didn’t start looking at how trauma impacts families, we were going to have families coming back and back and back. Neri: In 2010, we started trainings for everyone in the court to learn how the brain is affected by trauma. It was mindboggling to see those images of the brain. We learned that people are reacting the way they’ve learned to cope with trauma. It may not be the best way, but it’s helped them survive. Then we started with small changes. For instance, the televisions in the waiting rooms were set to news channels playing scenes of horrific events right before families had to deal with their own crises in court. So we made a simple shift—now we play videos about parenting, or lists of positive things going on in the community, to have a calming impact. Over time, we’ve tried to make sure that everything in our courtroom is based on five principles—safety, trustworthiness, choice, collaboration and empowerment. We try to work with families instead of doing things for them. We also learned that just sending someone to the county mental health center is not necessarily going to get them the type of counseling they need. Now if someone has been traumatized we send them to trauma counseling. If they’re not bonding with their child, we send them to attachment-oriented therapy. Everyone in the courtroom also tries to be friendly, because if our attitude is punishing, we’re not going to make progress. We see that parents who used to be cowering or defensive are smiling and participating. Neri: Now we have permanency sooner. We have more resolutions and settlements than termination proceedings.